Maldives has been the most sought after beach holiday destination since it started concentrating on developing its resorts to boost tourism. Having suffered a series of natural disasters in the past few years, Maldives is currently enjoying incredible growth again. It has bounced back from major setbacks like the coral bleaching wrought by el Niño and the horror of the 2004 tsunami. With its beautiful white beaches, sapphire blue waters and friendly atmosphere, the country has become the epitome of paradise for honeymooners, sightseers and diving/surfing enthusiasts. 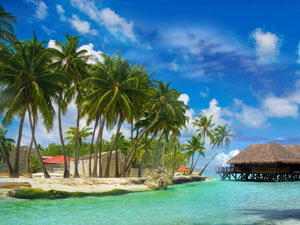 Formed of 26 atolls, Maldives is a geological peculiarity nestled in the middle of the Indian Ocean. These atolls are a series of ancient coral reefs that grew up around the sides of towering prehistoric volcanoes. These immense structures have long since sunk into the ocean, leaving behind coral islands of incredible natural beauty. These islands are now being occupied by travelers seeking unmatched pampering and romance, from the modernity and hustle and bustle of Male’ to the tranquil ambience of the Southern Atolls.